When Awesome Support is installed, it is ready to go right out of the box. However, there are numerous options you can use to fine-tune its behavior. Almost all of these options are located in the TICKETS->SETTINGS screen. Control the default assignee (agent), the order in which replies appear, the number of replies per page for each ticket and more. Additionally, with third party tools you can tighten or loosen your security by assigning WordPress Capabilities to various roles. 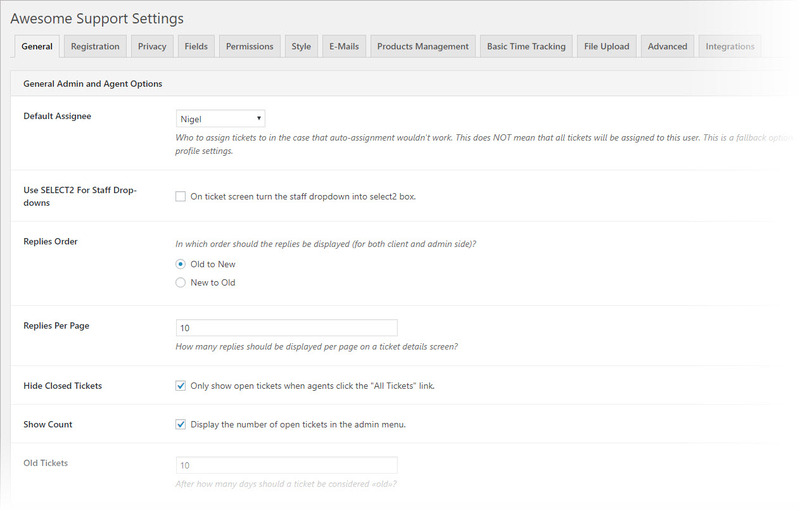 Almost all premium add-ons will also include their configuration options in TICKETS->SETTINGS, adding their own tabs to the screen as necessary.